I’m not a “big crowds” person, generally. I don’t go to concerts, I skip school reunions, and I avoid the mall on Saturday afternoons as though my life depended on it. That being said, you can probably imagine my trepidation as I stood outside the airport waiting to catch the bus headed to the Episcopal Communicators conference in downtown Cincinnati. (I know, I know – a SHY communications person? We really do exist, I swear.) Talking back and forth with hundreds of people on Facebook and email is one thing, but meeting them in person is a somewhat more nerve-wracking experience, especially as a first-time conference attendee. I sat at the bus stop nervously checking the conference and metro schedules on my phone, and whether it was the look on my face or the fact that I was obviously an out-of-towner, two young guys waiting for the same bus took pity on me. In the thirty minutes it took us to get from the airport to the hotel, they’d explained to me which stop was mine, gave me at least four recommendations on where to eat, told me where they were staying in case I needed anything, and sent me off with wishes to “have a great time!”. Grace pops up in the oddest places, but it’s usually when we need it most. I suppose my initial worries about the conference were unfounded – in a room full of professional communicators, it’s almost impossible not to be drawn into conversation unless you’re actively working at it. There were roughly 150 people from all corners of the country in attendance, and the noise level in the room could be described as ‘lively’. I slipped into an empty seat about halfway between the door and the announcer’s podium, and within moments I’d been introduced to everyone at the table, and another first-time attendee from southern Florida (who was simultaneously updating his Facebook page in both English and Spanish) asked me which workshops I was planning to attend. I was in! “AND ALSO WITH YOU!” rang out from every corner of the room, and then there was silence. Amazing! It’s even more amazing when you consider that this response, and the liturgy as a whole, is something we all share in spite of our manifold differences. The Episcopal Communicators are quite a mixed bunch. Over the course of the conference I met a delightful young lady from Oregon state and a gentleman from London, a woman who was the sole communicator for her small parish in Maryland and another who was head of communications for the entire state of Minnesota, men and women, baby boomers and millennials, Episcopalians, Catholics, and one woman who regularly attends a Quaker service (!). So many differences, but all united in their purpose of sharing the good news of Jesus Christ. The thing that really sold me on the greatness of conferences is that you have an incredible bank of talented people all within reach, sharing their ideas and resources freely. 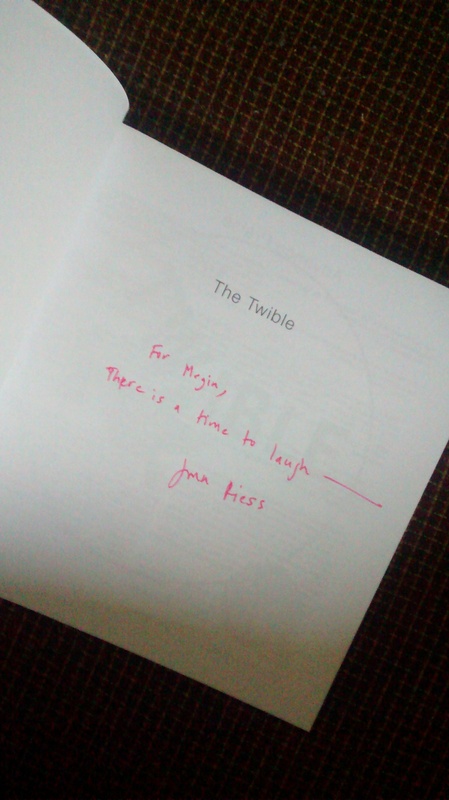 Jana Riess, the keynote speaker and author of The Twible, was a wealth of information during her addresses, and between times she made herself available to anyone who wanted to chat (or get their book copy signed). As for workshops, there were at least two media teams that had tips on how to tailor your church’s social media presence; Scott Gunn of Forward Movement gave a tutorial on how to take pictures with basic point and shoot cameras; Episcopal Relief and Development had a highly interesting discussion on the Asset Map (which is a fabulous resource for churches) – and this was just from the professionals during formal workshop time. Conversations were happening EVERYWHERE – at the breakfast table, in the elevator, at the yarn store (knitters gotta knit!). The spontaneous discussions were just as productive as the workshops, in some ways – comparing situations with others ‘on the ground’ and seeing what each of us does differently can be both eye-opening and instructive. As someone relatively new to diocesan communications I wasn’t sure that I would have much to offer others, but in the course of conversation it happened that we spawned some new ideas for reaching out to college students, and I had some input in a promotional video concept for Taize services. (Don’t discount your contributions out of hand – God may have plans you’re unaware of!) Plus, as a result of those spontaneous meetings we were all able to share contact information for continued collaboration outside conference time, so the fun didn’t end when we said goodbye Saturday morning. No one, and no church, should be an island – if we want to share God’s story and be part of the Jesus Movement, we need to take a chance and come out of our shells a bit. So, from my shy self to you, a word of recommendation: communicate! “And he said to them, ‘Go into all the world and proclaim the good news to the whole creation.” Mark 16:15 I think you’ll be glad you did. Megin Sewak is Communications Specialist for the Diocese of Northwestern PA. This entry was posted in Events, Humor and tagged communication, EpisComm, Good News, Megin Sewak. Bookmark the permalink.